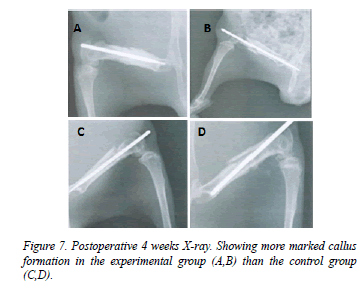 The effect of low level laser on the guinea pig femur fracture healing. Purpose: This study was conducted to evaluate the effectiveness of the low level laser on the fracturehealing of the guinea pig femurs. Materials and methods: This study was performed on 36 guinea pigs (17 in the experimental group and 19 in the control group. After anesthesia of the guinea pigs, the shaft of femur was fractured with Gigli saw under aseptic conditions, and then the intramedullary nailing of K-wire was performed. The application of low level laser on the fracture sites in the experimental group began 2 days after the operation under anesthesia, for 30 minutes every 2 days. The laser we used was a CW-type microchip laser with output wave length of 890 nm and intensity of 13 mWatts, measuring up to 4.68 J/cm3 per each application. In order to compare the femur fracture healing process of both groups; gross findings, simple radiologic findings, and histologic findings of fracture site stability were evaluated. The simple radiologic and histologic findings were assessed by the scoring system invented by Zorlu and his colleagues. The statistical evaluation was done by using repetitive measured ANOVA test. Results: In both experimental and control groups, the gross findings progressed favorably. Although the improvement in radiologic findings were found in both groups with the passage of time, the experimental group showed a greater rate of callus formation with statistical significance (p<0.01) compared to the control group. 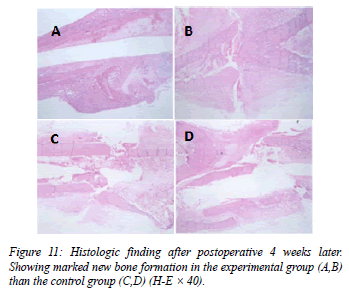 The result of histological findings showed that an increase of osteoblastic proliferation was also greater in the experimental group (p<0.01). Conclusion: In this study, the low level laser was revealed to be effective on acceleration of femur fracture healing in guinea pigs. Guinea Pig, Fracture healing, Low level laser. The healing of fracture needs long duration of time and has possibilities of many complications such as non-union and delayed union. Now there are variable reports about the methods for promoting fracture healing. A decent amount of ultrasounds, electronic stimulations, fine motion exercise is known as a method for shortening the fracture healing processes [1-6]. Lately, there is a report of laser as having same effects with ultrasounds or electronic stimulations [7-10]. Although orthopaedic surgery department or dental surgery department had done experiments partially for using ultrasounds with laser simultaneously [7,9-11], there is much controversies in report that studied laser-only therapy so far. Laser is some kind of a light wave or an electromagnetic wave; it has some different characters from beams that we know normally. Laser is specific lights and kinds of electromagnetic waves that have relatively short wavelength, that composed of electrical wave and magnetic wave which propagated in light speeds. Living body cells that absorbed low level laser transfer light energy into chemical energy which can be used as healer of cell damage; it is called bio-stimulation effect. Photoirradiation using low level laser can induce biological and physiological effect in variable enzymes, tissues and organs. In case of low level laser, effects for some soft tissues like promotion of collagen synthesis and wound healing procedure, it is already been reported [12-15]. It is also known as increasing manifestation of growth factor in cell. So, we conducted study on hypothesis that low level laser can stimulate fracture healing by biomechanical and biochemical character for guinea pig; increase of blood circulation, shortening of cell proliferation, and ATP synthesis-induced potential energy increase, light energy effect, etc. This experiment is for female guinea pig which is 9 weeks of birth and English Hartley species. Their body weights are from 552 gm to 635 gm, mean 610 ± 56 gm. We divided 42 guinea pigs into two groups; experimental groups that we broke their right femur, and control groups that we broke their left femur. We excluded 3 pigs which died at 3 weeks and 5 weeks, and 3 pigs which founds to be had infection at wound site. So the last experimental group consisted of 17, and control group consisted of 19 guinea pigs. We injected 5% Ketamine (Yuhan. corp. Korea) 0.5 cc/gm IM on buttock for anaesthesia, apply longitudinal skin incision at lateral thigh aseptically. Then, we dissected muscle, let femur shaft exposed, tried to make transverse fracture by sterile Gigli saw (Figures 1 and 2). But, in the process of making fracture, variable types of fracture were made. After that, we did intramedullary 1.4 mm K-wire pinning by sterile drill (Figure 3). The internal fixation did fix whole femur shaft well, but some of cases showed K-wire migration by guinea pig's movement. We sutured operation site by Nylon. We injected IM antibiotics (Cefazedon Kukje Phar. Korea) 0.05 gm/100 gm on each group until post-operation day 7. 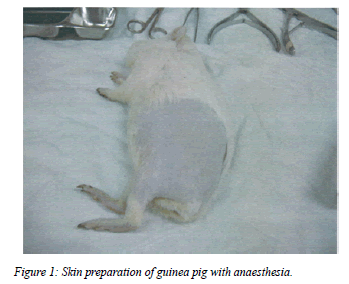 Figure 1: Skin preparation of guinea pig with anaesthesia. 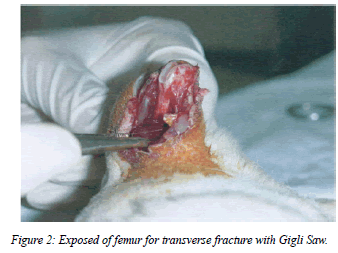 Figure 2: Exposed of femur for transverse fracture with Gigli Saw. 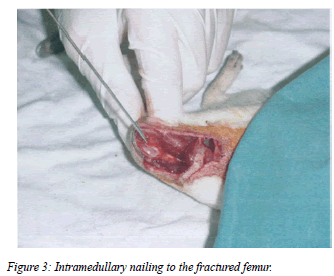 Figure 3: Intramedullary nailing to the fractured femur. From post-operation day 2 to 6 weeks, the application of low level laser on the fracture sites in the experimental group began 2 days after the operation under anesthesia, for 30 minutes every 2 days (Figure 4). The laser we used was a CW-type microchip laser with output wave length of 890 nm and intensity of 13 m Watts, measuring up to 4.68 J/cm2 per each application. The application length was 1cm from the skin. 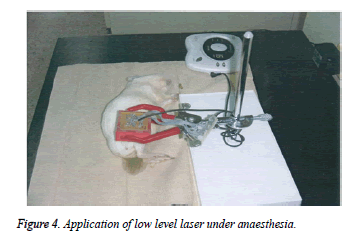 Figure 4: Application of low level laser under anaesthesia. We picked each group’s 6 guinea pigs randomly and injected plenty of Ketamine in heart on post-operation 2 weeks, extracted femur and fixed them by 4% paraformaldehyde. We put them in a solution for 10 days consequently and in 5% sodium sulphate solution for 24 hours. After that, we made haematoxylin-eosin dyed specimen slide. Also, we extracted tissues from total 36 guinea pigs as above procedure at postoperation 4 weeks and 6 weeks. The radiologic evaluation was proceed on 2,4,6 weeks from operation day just after the guinea pig expired. Femur lateral film was taken under 43 Kv, 3.2 mAs condition. In order to compare the femur fracture healing process of both groups; gross findings, simple radiologic findings, and histologic findings of fracture site stability were evaluated. The simple radiologic and histologic findings were assessed by the scoring system invented by Zorlu et al.,  (Table 1). Also, the callus surface was analysed quantitatively by Scion Image (Scion version 16, USA) and took statistics. The gross findings were scored by 3 orthopaedic surgeons by manipulation of fracture site by their hand for measuring intensity and elasticity. The evaluation of radiologic tests was done by two radiologists and one orthopaedic surgeon, histologic evaluation was done by two anatomy pathologists. The statistical evaluation was done by SPSS 12 (Sigma, USA) and using repetitive measured ANOVA test for comparing each group’s difference. Table 1: Modified Zorlu Scoring System. The experimental group’s score were increased statically significant; 1.13 ± 0.52 at post-operation 2 weeks, 2.17 ± 0.75 at post-operation 4 weeks, 3.0 at post-operation 6 weeks (p<0.01). Control group also showed increasing score, 1.01 at post-operation 2 weeks, 1.50 ± 0.55 at post-operation 4 weeks, 2.17 ± 0.41 at post-operation 6 weeks (p<0.01), so both group showed recovery by time passed (Table 2 and Figure 5). Table 2: The result of Gross findings (Zorlu scoring system). Figure 5: The result of gross findings of experimental and cointrol groups. There was no large difference statistically after 2 and 6 weeks. But 4 weeks had the biggest difference. There was no statistically significant difference between the two groups at 2 and 6 weeks after fracture. However, at 4 weeks, the difference was statistically significant (p<0.01). The experimental groups score were increased statically significant; 0.83 ± 0.41 at post-operation 2 weeks, 1.83 ± 0.42 at post-operation 4 weeks, 2.67 ± 0.52 at post-operation 6 weeks (p<0.01). Control group also showed increasing score, 0.33 ± 0.52 at post-operation 2 weeks, 1.33 ± 0.57 at postoperation 4 weeks, 2.33 ± 0.54 at post-operation 6 weeks (p<0.01), so we figured out that the bone union was faster in the experimental group than in the control group (Table 3, Figures 6A-6D, Figures 7A-D and Figures 8A-D.) and showed statically significant (p<0.01, Figure 9). Table 3: The result Radiologic findings (Zorlu scoring system). Figure 6: X-ray showing intramedullary nailing sate in both group after post-operative 2 weeks later. The bone union in the experiment group (A,B) was faster than the control group (C,D). Figure 7: Postoperative 4 weeks X-ray. Showing more marked callus formation in the experimental group (A,B) than the control group (C,D). Figure 8: Postoperative 6 weeks X-ray. Showing state of complete bone union in the experimental group (A,B) and state of delayed union in the control group (C,D). 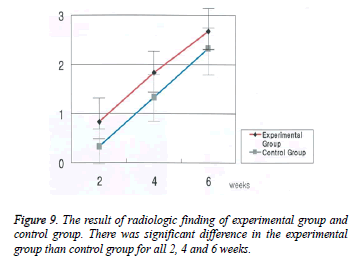 Figure 9: The result of radiologic finding of experimental group and control group. There was significant difference in the experimental group than control group for all 2, 4 and 6 weeks. The experimental group’s score were increased statically significant; 1.33 ± 0.52 at post-operation 2 weeks, 3.00 ± 0.89 at post-operation 4 weeks, 3.83 ± 0.41 at post-operation 6 weeks, showing increased callus formation as time pass (p<0.01). Control group also showed increasing score, 0.50 ± 0.55 at post-operation 2 weeks, 1.33 ± 0.52 at post-operation 4 weeks, 3.00 ± 0.89 at post-operation 6 weeks (p<0.01). Both group showed meaningful histological changes as time passed (Table 4, Figures 10A-10D, Figures 11A-11D and Figures 12A-12D). 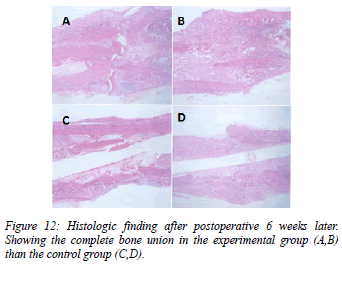 There was significant difference in the union of fracture histologically between the experimental and control groups at postoperative 2, 4 and 6 weeks (p<0.01, Figure 13). Table 4: The result of Histologic findings (Zorlu scoring system). 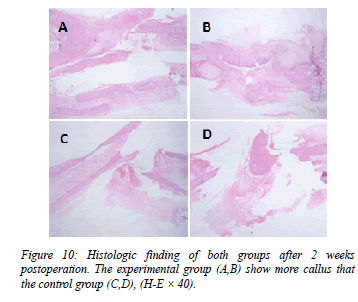 Figure 10: Histologic finding of both groups after 2 weeks postoperation. The experimental group (A,B) show more callus that the control group (C,D), (H-E × 40). Figure 11: Histologic finding after postoperative 4 weeks later. Showing marked new bone formation in the experimental group (A,B) than the control group (C,D) (H-E × 40). Figure 12: Histologic finding after postoperative 6 weeks later. Showing the complete bone union in the experimental group (A,B) than the control group (C,D). Figure 13: The result of histological findings of experimental and control roups. 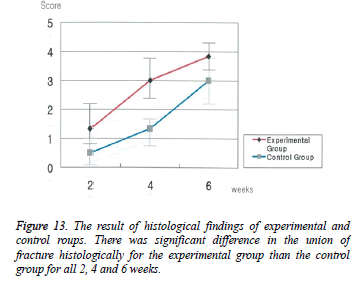 There was significant difference in the union of fracture histologically for the experimental group than the control group for all 2, 4 and 6 weeks. Scoring system total score by Zorlu et al. As we integrated gross findings and simple radiologic test, histologic tests by Zorlu’s scoring system, the experimental group’s score were increased statically significant; 4.5 ± 0.55 at post-operation 2 weeks, 11.5 ± 1.64 at post-operation 4 weeks, 21.0 ± 1.26 at post-operation 6 weeks (p<0.01). Control group also showed increasing score, 1.83 ± 0.75 at postoperation 2 weeks, 6.02 ± 1.67 at post-operation 4 weeks, 13.50 ± 1.87 at post-operation 6 weeks (p<0.01). Zorlu’s score was significantly higher in the experimental group than in the control group at postoperative 2, 4 and 6 weeks as same as all above results (Table 5, Figure 14 and Figure 15). Table 5: The result of Zorlu scoring system. Figure 14: The result of score of Zorlu scoring system of experimental groups than control groups. 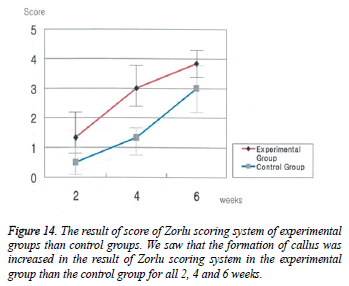 We saw that the formation of callus was increased in the result of Zorlu scoring system in the experimental group than the control group for all 2, 4 and 6 weeks. Figure 15: The result of image analysis of callus area. 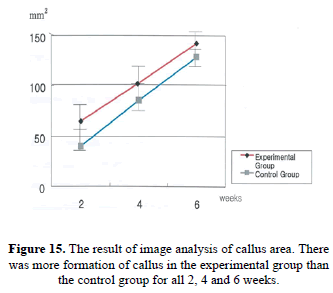 There was more formation of callus in the experimental group than the control group for all 2, 4 and 6 weeks. Fracture site healing is affected by multiple factors; not only hormones, vitamin, general condition, but also peripheral circulation, weight bearing, condition of fracture site. Fracture healing process which is called ‘bone formation’, is done by following 3 way; first, direct bone healing, second, distraction osteogenesis, third, indirect bone healing. In indirect bone healing, extra-callus formation contributes to fracture site’s stability, commonly used in fracture healing study for its variable changes by biological and physical stimulation. Lately, indirect bone healing process is assessed by molecular biologically, separates hard-callus and soft-callus for studying gene expression of bone specific matrix protein and cartilage specific matrix protein by Northern hybridization for each healing steps, matrix protein formation is steady and supposed by self-regulation mechanism in gene transcription process . This normal healing process is known after Wolff et al. presented physiological stimulation may affects musculoskeletal system structurally and functionally in 1892 . Yaakobi et al. reported that alkaline phosphatase and calcium expression time are much faster in experimental groups than in control groups about 1 week, same with that of osteoblast amount about 2 times, in the study which was about rabbit’s tibia fracture using low level He-Ne laser. In this study, there were no statistic significant difference in gross findings on 2 weeks and 6 weeks, except 4 weeks. Because 2 weeks were not enough time for bony union in gross finding for both groups, and 6 weeks were much enough time for bony union that both groups were the same not regarding low level laser. There were statistic significant findings in radiologic, histologic, and quantitative osteophyte formation in experimental group compared to control group. Radiological and histological analysis showed that at the time of 2 weeks, there was already statistically significant difference so that low level laser affects bony union stimulation before 2 weeks. We have limitation as followings; fracture type was not consistent, low objectivity in the way of bony union assessment, K-wire internal fixation was not in the same condition. And also, there were no mention about exact mechanism on how laser use is effective in fracture healing. We did not study about fracture healing associated with radiation time and amount, so there should be additive study on variable intensity, frequency, radiation time on animals or human body. In the clinical medicine future, laser has some advantages in destructive powers on target intensively in an instant, also in low damage on peripheral tissue inducing concentrated application on lesion. We expect for low level laser to be applied on disease which were thought to be incurable. 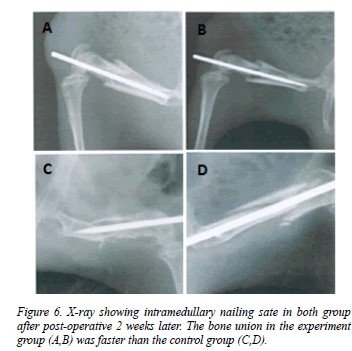 We did internal fixation after we broke 36 guinea pigs' femur (mean body weigh 610 ± 56 gm, 9-weeks-old), and the application of low level laser on the fracture sites in the experimental group began 2 days after the operation under anesthesia, for 30 minutes every 2 days. The laser we used was a CW-type microchip laser with output wave length of 890 nm and intensity of 13 mWatts, measuring up to 4.68 J/cm3 per each application. In this study, the low level laser was revealed to be effective on acceleration of femur fracture healing in guinea pigs. The present research was conducted by the research fund of Dankook University in 2015. Buckley MJ, Banes AJ , Levin LG , Sumpio BE , Sato M , Jordan R , Gilbert J , Link GW , Tran Son Tay R. Osteoblasts increase their rate of division and align in response to cyclic, mechanical tension in vitro. Bone and Min 1988; 4: 225-236. Cochran GVB, Johnson MW,Kadaba MP, Vosburgh F,Ferguson-Pell MW,Palmeiri VR. Piezoelectric internal fixation devices: A new approach to electrical augmentation of osteogenesis. J Orthop Res 1985; 3: 508-513. Heckman JD, et al. Acceleration of tibial fracture-healing by non-invasive, low-intensity pulsed ultrasound. J Bone joint Surg 1994; 76: 26-34. Rubin J. Pressure regulates osteoclast formation and MCSF expression in marrow culture. J Cell Physiol 1997; 170: 81-87. Yasuda. Electrical Callus and Callus Formation by Electricity. ClinOrthop 1977; 124: 53. Ziskin MC.Applications of ultrasound in medicine- comparison with other modalities.Ultra- sound 1987. 49-59. David R, Nissan M, Cohen I, Soudry M. Effect of low-power He-Ne laser on fracture healing in rats. Laser Surg Med 1996; 19: 458-464. Garavello-Freitas I, Baranauskas V, Joazeiro PP, Padovani CR, Dal Pal-Silva M, da Cruz-Hoflin MA. Low-power laser irradiation improves histomorphometrical parameters and bone matrix organization during tibia wound healing in rats. J PhotochemPhotobiol B 2003; 70: 81-89. Guzzardella GA, Torricelli P, NioliAldini N, Giardino R. Laser technology in orthopedics: preliminary study on low power laser therapy to improve the bone-biomaterial interface. Int J Artif Organs 2001; 24: 898-902. Yaakobi T, Maltz L, Oron U. Promotion of bone repair in the cortical bone of the tibia in rats by low energy laser (He-Ne) irradiation. Calcif Tissue Int 1996; 59: 297-300. Yang KB, Yang KH, Wang SJ, Lewallen DG, Greenleaf J. Low intensity ultrasound stimulates fracture healing in rat model: biomechanical and gene expression analysis. Trans Orthop Res Soc 1994; 19: 519. Hall RR. The healing of tissure incised by a carbon dioxade laser. Brit J Surg 1971; 58: 222-225. Horoszowski H, Farine I, Engel J. The laser in orthopaedic surgery. Proceedings of the 1st International Symposium on Laser Surgery 1975; Jerusalem Academic Press. Luger EJ, Rochkind S, Wolliam Y, Kogan G. Effect of low-power laser irradiation on the mechanical properities of bone fracture healing in rats. Laser Surg Med 1998; 22: 97-102. Trelles MA, Mayayo E. Bone fracture consolidates faster With low-power laser. Lasers Surg Med 1987; 7: 36-45. UmranZorlu,; Mustafa Tercan, İrfanÖzyazgan, IşikTaşkan, YildizKardaş, FarukBalkar, FigenÖztürk.Comparative study of the effect of ultrasound and eletrostimulation on bone healing in rats. American Journal of Physi - cal Medicine& Rehabilitation1998; 15: 427-432. Wolff J. The law of bone remodelling, Springer 1986.